Benton's are the exclusive Victorian stockists of the Blucher Pres-Fit Stainless Steel Piping System for commercial applications. Blucher 316 Stainless offers large time savings compared to welding and can be installed quickly and safely without flame or draining down to form a permenant join in seconds. With a low profile M-Profile socket, the fittings press square to the tube rather than an overlap for easier cleaning. Blucher were the first to supply stainless steel press-fit into Australia and have supplied to projects large and small since 2002. 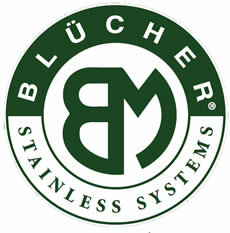 Installed quickly and easily, Blucher is the preferred method for installing stainless steel pressure pipework. Blucher Press-Fit is approved to convey potable (drinking) water, compressed air, oil & fuels, instrument air, natural and inert gases. Using the 316 grade of stainless steel provides resistance to most chemicals and additives that are prevalent in food processing and cleaning processes. Available in metric diameters 10 to 168.3mm. Full quality control with 3.1 certificate traceability for tube & fittings. Full tooling solution specifically engineered for 316 stainless. Install without welding or threading - flame free installation. Suits a wide range of applications up to 200°C. Stainless steel is fully recyclable (closed loop) and long lasting. WaterMark and ActivFire (CSIRO) approved. For more information please contact the team at Benton's Derrimut on (03) 9361 6161 or visit Blucher's Web Site.